David B. Wilson, MD joined the Center for Orthopaedics and Sports Medicine in June 2005. Dr. Wilson specializes in general orthopaedics with subspecialty fellowship training in orthopaedic surgery sports medicine. Dr. Wilson earned a Bachelor of Arts degree in Natural Science in 1986 from John Hopkins University in Baltimore, Maryland. Dr. Wilson graduated from medical school at the University of Pittsburgh in 1992. 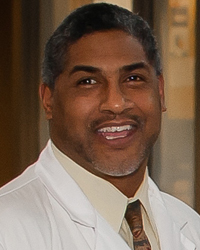 In 1997 he completed a four-year orthopaedic surgery residency at Howard University Hospital in Washington, D.C.
Dr. Wilson went on to complete a one-year sports medicine fellowship in Rochester, NY. During his fellowship he provided sports medicine coverage for the following teams: University of Rochester, St. John Fisher College, Rochester Red Wings, Rochester Rhinos and the Rochester Knighthawks. Post graduate, Dr. Wilson provided sports coverage for Washington, D.C. Public Schools and Howard University. Dr. Wilson is a fellow of the American Academy of Orthopaedic Surgeons and certified by the American Board of Orthopaedic Surgery. Dr. Wilson is a member of the American Medical Association, Pennsylvania Medical Society and the American Orthopaedic Society of Sports Medicine. Dr. Wilson serves as team physician for Indiana University of Pennsylvania (IUP) and area high schools. You can view a pdf of Dr. Wilson’s Curriculum Vitae here.